Introducing our Telescoping Flagpole HD (Heavy Duty). The pole is 4 sections. The base of this pole is 2.57" (for the 18' Hd) and 3.00" (for the 20 and 25' HD) with a heavy duty wall thickness. 18' HD poles comes with 3x5 US Nylon flag and the 20' and 25' HD pole comes with 4'x6' US nylon flag. and a 10 year warranty. Finely crafted for you at our factory in Willmar, Minnesota! Uncommon USA is proud to offer our 18', 20' or 25' Presidential telescoping flagpole in HD (heavy duty). The HD poles are designed for areas receiving high winds. Same Uncommon quality, for areas and weather demanding HD materials! The HD pole comes fully assembled with (3 sections on 18 HD)4 moving sections. The anodized aluminum sections lock into place with our heavy duty stainless steel pin. The pin is visible so you know the pole is locked into place. It features heavy duty harness rings that are free floating to accommodate various sizes of flags. It can fly two flags at once or one flag at half staff. The diameter of the pole, the gauge and thickness of the aluminum make it the strongest telescoping flag pole in the industry. There is a 10 year warrantee against manufacturers defects. 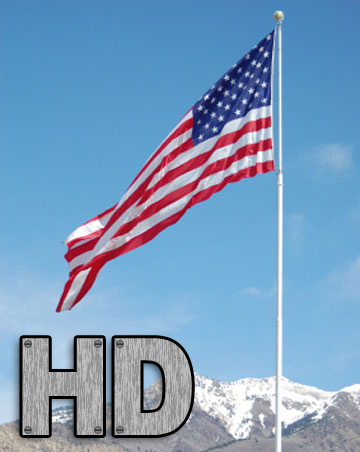 All HD poles come with a 3x5 or 4x6 US nylon flag. The US flag is constructed with 1/4 inch seams and x-boxing on the fly hems to help prevent wear and tear. The flag is solar max treated for ultra violet rays and the threads are color matched to give you the best looking flag on the block. Both poles and flags are MADE IN AMERICA! Our Telescoping Flagpoles are simple to use! Due to the unique design of the Uncommon USA, Inc. Telescoping flagpole, each section of the pole raises and lowers easily. Match the arrow to the hole, click the button in place, and with a simple press of the "release" button down your flagpole slides. Your satisfaction is guaranted on every Telescoping Flagpole! 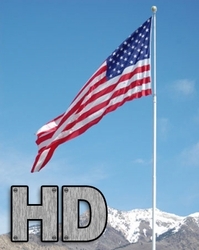 Uncommon USA is so sure that you'll be delighted with your Flagpole HD purchase that we offer a 90 day satisfaction guarantee along with a 10 year warranty. If someone should steal your flagpole just send us a legitimate police report, insurance information, and bill of sale and we will replace your flagpole! Each Uncommon USA, Inc. Flagpole HD comes complete with a 3 inch Gold Aluminum Ball Ornament, to dress the top of your flagpole, a double flag harness to fly two flags or fly a flag at half mast,3'x5' or 4' x 6' USA Flag with Embroidered Stars and Sewn Stripes and an Installation Sleeve with complete instructions. The Flagpole HD comes in a bronze or silver finish!